There are a few things about this poster that I like. The retro look, for one, is very well done and matches well with the fact that this is a period piece. The yellow background is a little “loud”, but it does contribute to the retro look and it makes the image stand out a little more. And I think the poster makes the movie seem like a social message/activism movie. And as a pretty serious one at that. However, the poster is also a little cold and overly serious. I didn’t particularly like the first poster because it was such a cliche, and a poorly executed one to boot. But the image did have a sense of warmth and of community. I also get both of those things from the trailer, but not from this new poster. I enjoy looking at this poster much more than I enjoyed looking at the first. I in many ways I like it for itself. 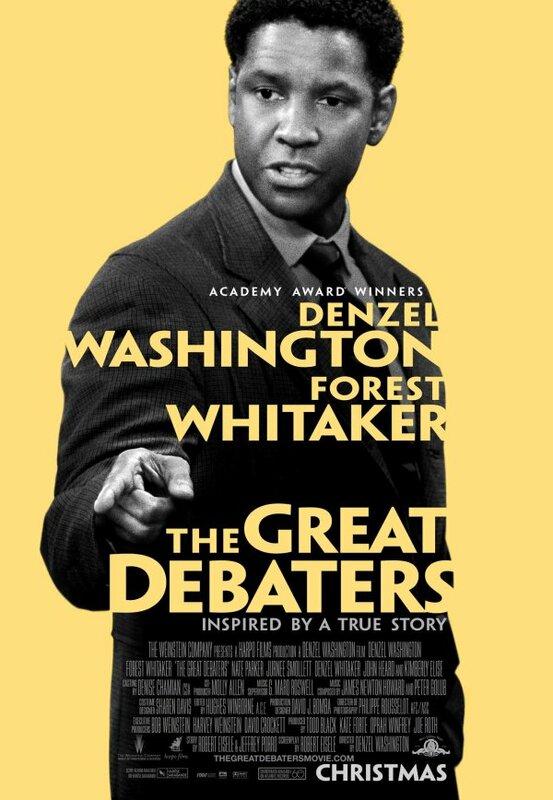 But The Great Debaters has “feel good movie” written all over it, and the poster lacks that element, making it bad fit with the rest of the marketing campaign. This was an absolutely fire movie. I enjoyed every minute of it. Great camera work and lighting. Hats off!